Does everyone look at pictures from their childhood with a sense of wonder and disgust? If so, what is the purpose of groveling in the emotional flux they cause? Squinting at the blurry images (after all photographic arts in the digital age tout the quality of “high definition,” meaning back when this old photograph was taken, the figures blurred like someone didn’t use the auto-focus. Wait! Auto-focus probably hadn’t been invented yet), heads shake over the choice of clothes, the style of cars and the general lackluster appeal of the backdrop for the picture. A smile or self-deprecating shrug accompanies a continued study of the ancient documentation of bygone days. Yell at my mother. That’s the first thing I want to do when I find a picture from the summer of 1976. Something along the lines of, “How could you dress me that way?” Of course, when my dress nearly matches hers for pea-soupiness, what sort of reply do I expect? Upon further reflection of the day, I feel slightly chagrined. I recall the trips to the sewing room to try out this “lovely” dress and feeling somewhat in awe of how my mother could work her foot in time with the needle as she slid the pieces of fabric under the arm of the machine. I’d rather be outside climbing a tree, but it seemed amazing that within a few hours, clothing could be ready for me to wear. Back in those days, I loved the color green. Shades of green dominate the Pacific Northwest landscape in every season of the year. As a certified member of the “I wish I were a boy” club, anything that reminded me of the outdoors topped my list of favorite things. The fact that clothiers of the 70s couldn’t mix a shade of green that resembled anything in nature hadn’t occurred to me when I requested a green dress. If I recall, my mother made all three of us dresses for Easter that year, and my sister and I chose the color we wanted. My sister adored blue. Don’t worry, the next year I wore her more appealing (in the color department anyway) blue dress, while the putrid green thing took up residence in the rag drawer. On the day of the photograph, I wanted to be dismissed from the grueling parade of posing by family units and age groups in front of some guy with a camera. No amount of itching and squirming relieved the discomfort of the polyester threads glued to my skin by perspiration. In fact, the thought of an entire watermelon (with seeds, they didn’t have the other kind back then) sounded more fabulous even than a run through a sprinkler. In this particular photograph, our foursome and my Aunt Arlene pose in front of the family car. I pretty much have no pleasant memories of the rust-colored Ford Granada in the picture. If you’ve ever ridden 2000 miles in the backseat of a car with your bossy sister, you can understand part of my abhorrence. In addition, the lovely web-shaped scar on my chin is courtesy of the old Ford. The winter after this photo’s freeze frame of time, my mother slid across the ice while rounding a corner on Fern Hill Road, crossed the center line and plowed into some ancient boat-like automobile driven by a lady of equal antiquity. On impact, my ankle lodged itself beneath the front seat and my chin smashed into the back of my best friend’s head. Instead of going to our bowling league that Saturday morning, we took a trip to the hospital, where I received eleven stitches in my chin. Remembering these delightful times in that ugly Granada doesn’t make me shiver with excitement. In fact, years later when my best friend (not the same person, obviously. After I knocked some sense into that girl with my chin, she happily waved goodbye when my family moved away and surely became friends with someone less hard-headed) drove me to school in her mom’s gray Ford Granada, I often gripped the door and squeezed my eyes closed when we rounded sharp curves. Does every photograph send us down this shivery lane of repulsion and delight (okay, some people call it “Memory Lane,” but let’s be real)? Not when we flip through the album’s pages (yes, some people have albums with real pages, not just computer directories), looking for a certain moment of time. Our eyes skim across the years in a split second proportionate to how long that event lasted when compared to our lifetime. When our children get the album, on the other hand, it becomes something of a nightmare journey. “I can’t believe you’re wearing white knee socks with sandals!” One of them chides, tipping the picture toward his brother, so he can also enjoy the horror of my wardrobe choice. “Sure, Mom. Blame Grandma,” the oldest laughs. When did his voice get so deep anyway? Whew! The focus shifts away from me and my embarrassment at being caught attired in puke green polyester. Why on earth do we keep a record of those hideous moments? Family historical documentation aside, some pictures have neither intrinsic nor extrinsic value. 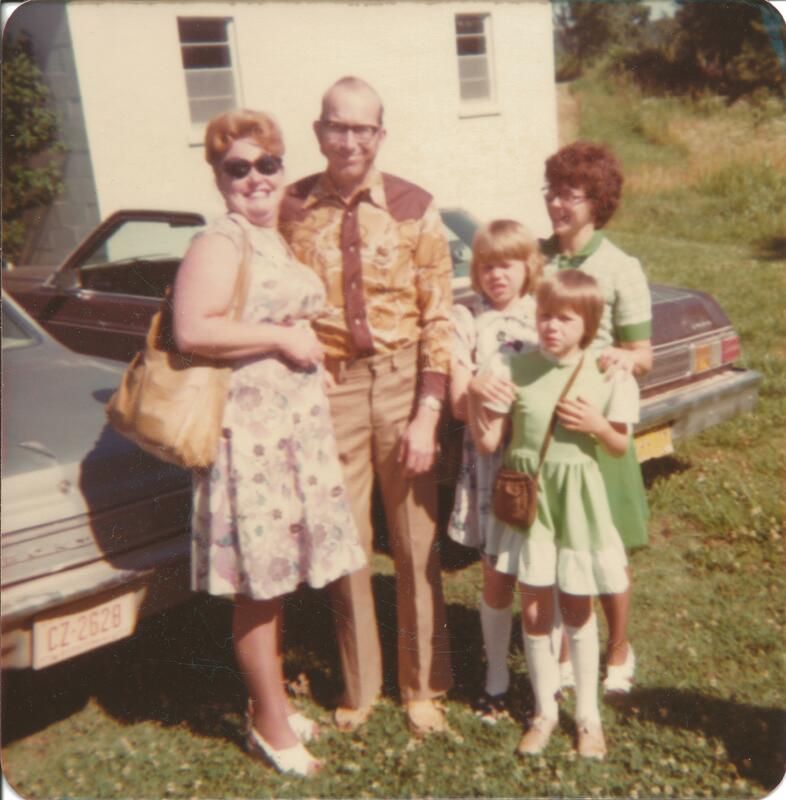 Reflecting more closely on this picture of my family (which was splintered in 1980), I recall the adventure of that road trip. Crossing the Rocky Mountains, getting a Pike’s Peak Centennial t-shirt, and meeting some first cousins who would play important roles in my future. A small smile plays on my lips, as the picture fades and memory kicks in. Shaking myself back to 2011, I’ve answered my own question. Mortification over wardrobe faux pas aside, this pictorial documentation of my personal history allows me to witness my life from a third person perspective. Removed from it only by time, I’m able to appreciate how it shaped me into the person I’ve become today. The reason for keeping this fodder for ridicule within reach of my children comes sharply into focus (unlike the old photograph). Regardless of our distinct differences, my current identity links inexorably with that 9-year-old girl in the green polyester dress.